I was born in the first half of the 1970s and lived the first 10 years of my life in a small rural village in mid Devon, UK, the next 8 were spent in an even smaller village. Well, I say an even smaller village, we lived outside of the village in a small clutch of traditional Devon cob cottages. These first 18 years of my life, as they would be in anyone’s, were deeply significant in forming my view of the world and the decisions I have taken along the way. I grew up riding bikes, doing some crazy things as well. I remember the time age 11 or 12 (and indeed, I still have the scars) when I snapped the handle bars clean off my Raleigh Striker in a ‘who can get the biggest air of a caravan levelling ramp’ competition. 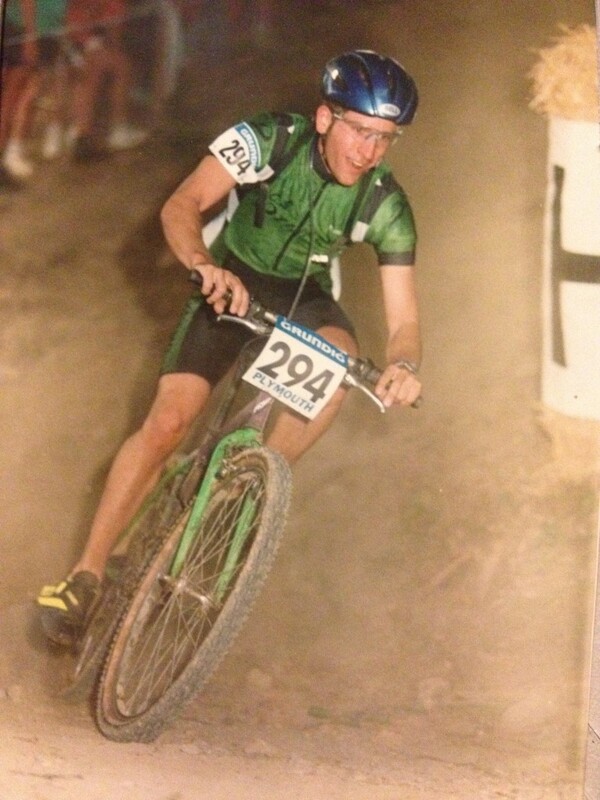 At 15 or so, I was regularly racing mountain bikes and road bikes from time to time. Cycling ran through my veins, it was part of my life.Living in the middle of nowhere, there were only really three ways to travel. Well four if it was a Wednesday and the bus was running.You walked or ran, cycled or begged for a lift. It was no wonder then, that the day I turned 17 I had driving lessons booked up. That said, cycling was still huge. At school, I was a bit of a late starter. I wasn’t really academic, like others in my family. I worked hard through school, but the best day of the week was always a Friday. Not for the reasons you might be thinking, but I was one of the lucky ones who was accepted on to the non-exam outdoor pursuits. So while friends got to do double maths or English, or woodwork (oh, hang on, I did that as a double on Wednesday – and got a B!) I went off in a minibus with 14 others, and we did proper work, like learning to ski, caving, orienteering (oh how I loved orienteering), climbing, canoeing, and so on. I was a Ten Tors regular and as part of the training I remember one year, probably 1993 or 4, doing the O.A.T.S Walk on Darrmoor. 29 miles in one day, Ivybridge to Okehampton. The first time I tried this, it took me 10h30 or so. I went back the next year having trained hard and did it in 8h15, one of the fasted walking teams. After two years of outdoor pursuits, 100+ mile cycling weeks and lots of bike races under my belt, I was, err, pretty average at a lot of things. After a summer job as a canoeing assistant (a BCU TI), I decided being an outdoor pursuits instructor was the life for me! I scrapped through with enough GCSE’s to get to the local, rapidly diversifying agricultural college and there I spent 3 years learning how to teach, and becoming an instructor. I loved this life, but soon worked out that there were not many careers out there, and it was full of tired, old looking instructors (I guess they must have been in their 30s!) working out how to fend off all these new young upstarts! So I paused, and went and lived in France for a year, learning how the french ran sports centres, and velodromes, and yes, I did a lot of cycling! And volleyball. And roller hockey. And sampling the French approach to dental reconstruction post sports injury! After this year, well, I returned to the UK with a growing list of careers that were not for me – pro cycling, no. Outdoor Ed instructor – no. Okay, what about sports therapist. I trained, and qualified over a two year period as a sports therapist, nutritionalist, and over subsequent years added a string of other qualifications such as an ND (doctor of naturopathy). I enjoyed this life. Being self-employed was hard. But, for a season or two I had the fortune to work for a pro mountain bike team, looking after Steve Peat, Rob Warner, and a bunch of others. This led (although it helped I was working for the BCF at the time) to working with the Olympic Mountain Bike Squad (including David Baker and Tim Gould) in the lead up to Atlanta. There was something about the carnival of the professional mountain biking circuit I loved (although plenty I was less keen on). Hanging out, working with and travelling the world with some of the worlds best cyclists was a blast. There was a fun trip to Budapest, where I happened to ‘forget’ to tell my crew I turned 21 on the final day of racing, knowing what they were planning for the evening. I spent a good five years, being a sports therapist and naturopath, but it was hard, physical work. Well, eventually I fell out of the world of complementary medicine and sports therapy. Marriage, children and need for a secure income have got me where I am now… somehow its worked out well! The seed germinated and has slowly grown. When, in 2008, I turned 34 I started running again after a 15+ year break, spurred on by a birthday gift of an iPod nano and a nike+ sensor. I actually started logging my runs using TrailRunnerX. I did run much, according to my running diary around 12-14 miles a week. Over the next few years it got more serious, and then through 2013, notwithstanding the coeliac blip, I have now managed to cover distances I never managed before. Some of this might have been an event focus; signing up to run the Great West Run also meant signing up to my own expectations as well as a training schedule. so there we are, a potted history of 25 years of my life and sport!